"Ruby Ridge's Randy Weaver says McVeigh's reason for bombing rings "
BEDFORD -- The white separatist who was at the center of the 1992 Ruby Ridge standoff says Timothy McVeigh's explanation for why he bombed the Oklahoma City federal building rings hollow. In a new book on the bombing, McVeigh says he targeted the federal building in revenge for federal agents' attacks at northern Idaho's Ruby Ridge and the Branch Davidian compound near Waco, Texas. "What the U.S. government did at Waco and Ruby Ridge was dirty. And I gave dirty back to them at Oklahoma City," McVeigh told the authors of "American Terrorist: Timothy McVeigh and the Oklahoma City Bombing". But white separatist Randy Weaver said McVeigh's explanation for why he made and exploded a truck-bomb in front of the federal building, killing 168 people on April 19, 1995, falls short. "McVeigh took the law into his own hands. He had justified it in his own mind. I don't agree with him at all," Weaver, whose wife and son died in the Ruby Ridge shootout, said Thursday. "He has more anger in him than I do, and I don't know how that could be." Weaver, who is southern Indiana this weekend to appear at a gun and knife show in Bedford, added: "What happened to me and my family is something we can never forget." During the Ruby Ridge conflict, Weaver's 14-year-old son, Samuel, was shot twice, once in the arm and then fatally in the back, and his wife, Vicki, was killed by a gunshot wound to the head fired by federal snipers. The shooting, in which a federal Marshal also was killed, occurred three years after Weaver allegedly sold two illegally sawed-off shotguns to undercover federal agents. On April 19, 1993, during an assault by federal agents, the Branch Davidian compound near Waco, Texas, burned to the ground, killing about 80 members of the cult. Federal prosecutors say the Oklahoma bombing was retaliation for the Waco catastrophe, which happened exactly two years earlier. McVeigh is scheduled to be executed May 16 at the U.S. Penitentiary near Terre Haute, Ind. Weaver and his daughter, Sara, have written a book, "The Federal Siege At Ruby Ridge," that details the events at Ruby Ridge. He will be selling his book at the Bedford National Guard Armory Saturday and Sunday. "We wrote the book for Sam and Vicki and to let people know something like this can happen to anyone and that we must keep an eye on our civil servants," Weaver said. "McVeigh sees child victims as 'collateral damage'"
BUFFALO, N.Y. - A remorseless Timothy McVeigh calls the children killed in the Oklahoma City bombing "collateral damage," regretting only that their deaths detracted from his bid to avenge federal agents' raid at Waco, Tex., according to a new book. American Terrorist: Timothy McVeigh and the Oklahoma City Bombing is the first time McVeigh has publicly and explicitly admitted to the crime and given his reasons for the attack. "I understand what they felt in Oklahoma City. I have no sympathy for them," McVeigh told authors Lou Michel and Dan Herbeck, reporters for The Buffalo News. McVeigh claimed he did not know there was a daycare centre inside the Alfred P. Murrah Federal Building, the authors said yesterday on PrimeTime Thursday. "I recognized beforehand that someone might be ... bringing their kid to work," McVeigh said. "However, if I had known there was an entire day care centre, it might have given me pause to switch targets. "That's a large amount of collateral damage." McVeigh chose the Alfred P. Murrah Federal Building, he said, because it had everything he wanted -- federal agents and glass in the front, making it vulnerable and giving TV cameras a good shot. But the FBI's lead investigator dismissed the bomber's claims he did not know there was a daycare on site. "No matter what ... if you look at the building, you're going to see all the little cut-out hands, all the little apples and flowers showing that there's a kindergarten there -- that there are children in that building," FBI agent Danny Defenbaugh told CNN. Mr. Michel said McVeigh's only regret was the children's deaths proved to be a public relations nightmare that undercut his cause. He added he was disappointed when part of the building remained standing after his 3,000-kilogram bomb went off. "Damn, I didn't knock the building down. I didn't take it down," McVeigh said. The April 19, 1995, bombing killed 168 people, 19 of them children. McVeigh, 32, is scheduled to be executed on May 16. McVeigh said he was the sole architect of the plan, resorting to threats against Terry Nichols' family when his army buddy hesitated before helping to load the explosives into the rental truck. In 75 hours of prison interviews with the Buffalo reporters, McVeigh, who was raised in Pendleton, N.Y., outside Buffalo, got choked up while talking about killing a gopher, but never expressed remorse for the bombing. However, he had been brought to tears two years earlier while watching the disaster at the Branch Davidian compound near Waco, Tex., in which 80 cult members died in a fire as federal agents raided their compound. The Gulf War veteran, a model soldier, carried out his attack two years to the day after Waco. Before deciding to bomb the Murrah building, McVeigh considered a number of different possibilities, including assassinating elected officials, Mr. Michel said. As he fled after the explosion, McVeigh recalled the song Dirty for Dirty by Bad Company. "What the U.S. government did at Waco and Ruby Ridge was dirty. And I gave dirty back to them at Oklahoma City," he said. In 1992 at Ruby Ridge, Idaho, the wife and son of white separatist Randy Weaver were killed by federal agents during a standoff. McVeigh told the authors he knew he would get caught and even anticipated execution as a form of "state-assisted suicide." He dismissed those who do not believe he planned the bombing alone, Mr. Michel said, quoting the film, A Few Good Men: "You can't handle the truth. "The truth is, I blew up the Murrah building," McVeigh said, "and isn't it kind of scary that one man could reap this kind of hell?" The book is to be published on April 3. "McVeigh acted in revenge for Waco "
TIMOTHY McVEIGH, the Oklahoma City bomber, has hinted for the first time that he carried out the 1995 truck bombing in retaliation for the cult disaster in Waco, Texas. McVeigh has never before explained his motives for the attack that killed 168 people, including 19 children. In a series of letters to a reporter, published in Esquire magazine, he has indicated that he was motivated by the FBI siege of the Branch Davidian compound in Waco. 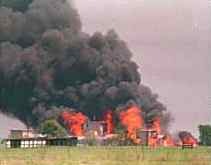 The siege ended in a fire killing about 80 cult members in 1993, two years to the day before the Oklahoma blast. The public . . . didnt care when these families died a slow, tortuous death at the hands of the FBI, he wrote. The prosecution at McVeighs trial alleged that he was motivated by Waco. McVeigh, 32, is due to die by lethal injection on May 16. "What the Waco Jury Never Heard"
In order to supplement the above news, we recomment the book by David Thibodeau "A Place Called Waco: A Survivor's Story" (see related article). Thibodeau, one of only nine Branch Davidian survivors of the attack, tells the story of the Branch Davidians and their dealings with federal agents. In light of subsequent government admissions, including a partial recantation in 1999 of previous denials that the tea gas used in the assault could have been incendiary, Thibodeau's detailed account of the storming of the compound and the fire that followed is still more important.